If you thought the original 1970s prototype armor for Boba Fett was colorful, Funko decided to do you one better! 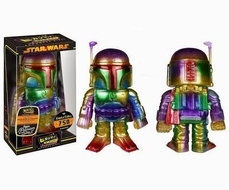 In stunning metallic shades, the Star Wars Prism Boba Fett Premium Hikari Sofubi Vinyl Figure is decked out in every color of the rainbow. Standing 8-inches tall, the Mandalorian bounty hunter is a limited edition of only 750 individually numbered pieces.